Earn Money and Loyalty Points by helping us spread the word about the benefits of early education - if you like our products or like what we do, refer your friends and be rewarded for it! 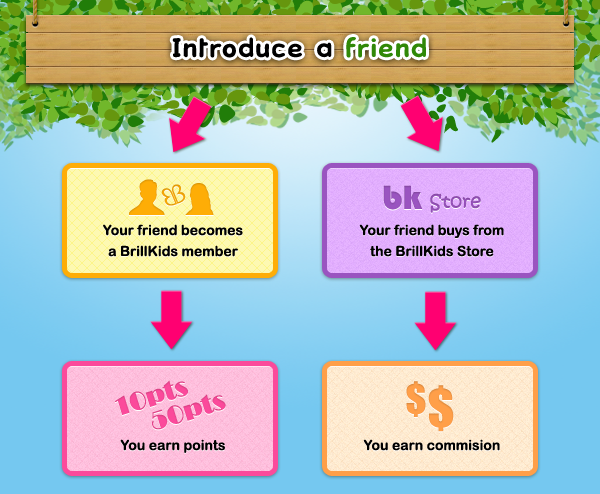 Earn loyalty points every time a friend becomes a BrillKids member and earn commissions of up to 30% each time one of your friends make a purchase! Your Affiliate Level is dictated by how much Sales Referrals you can generate on a 3-month period. Whenever you don't reach the amount of Sales Referrals to maintain your current Affiliate Level, you drop down one Affiliate Level. Note: Members who already have both Little Reader and Little Math licenses in their account automatically start at Affiliate Level 1. 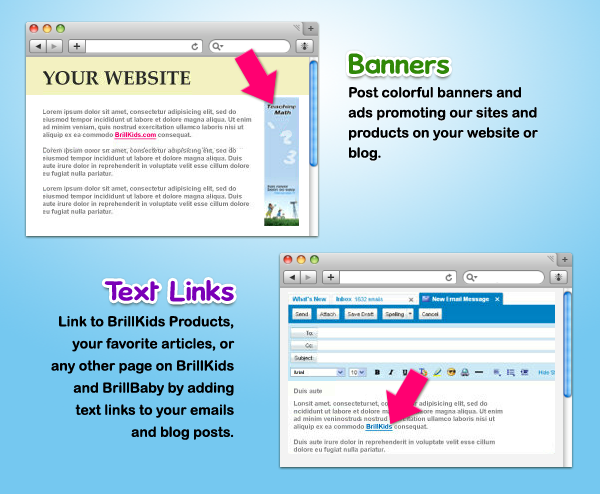 With our simple tools, you can choose several ways to introduce your friends to BrillKids.com. 1. Give them your Unique Coupon Code. As a registered affiliate , you will have a coupon code unique to you. Simply pass this code to your friends and have them insert the code during member registration or checkout. By using this coupon code, your friends will also benefit by getting additional loyalty points and other benefits during member registration and purchase from the BrillKids Online Store. 2. Give them your Affiliate Link. Do you manage a website or blog? You may also refer others by using your unique affiliate link. When a visitor clicks on your links, any member registration or purchase by that visitor will be credited to you even if no coupon code is inserted. Similarly, that visitor will also benefit by getting additional loyalty points or other benefits during member registration and purchase from the BrillKids Online Store. NOTE: This method is not guaranteed to work in all cases, as it relies on a "cookie" added to the user' browsers. This cookie may be deleted, should your referred friend decide to delete all internet data from his/her computer. Learn more about your customers and identify their preferences. What types of links motivate your customers to buy? What early learning products do they purchase from BrillKids.com? We provide easy to read reports that contain extensive data about the activity of your links to empower you to optimize your performance in the program. This information include details on your traffic, revenue, earnings, conversion rates, and link types. 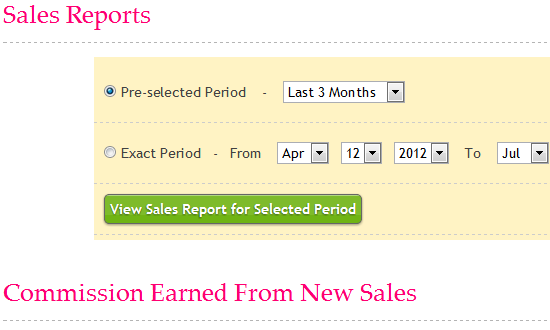 Up to date reports ensure you have the information you need to maximize the earning potential of your site. First off, you'll need a PayPal account so we can transfer your earned commissions there. If you don't have a PayPal account yet, sign up for one here. Once you start earning your commission, you can send us a request to be paid by clicking on a button in your Affiliate Account Information page - this will send us a notification that you would like for us to start paying you for your commission on a specific time period. Each commission payout require a minimum of $50.00 to be processed. NOTE: Each referral sale will have a waiting period of ONE MONTH before it is marked as payable commission. This is so we can ensure that the sale you referred will not request for a refund during the one-month money-back guarantee period. You need a PayPal account for us to transfer you your commissions in cash - if you don't have an account, sign up here (you may sign up later). I agree to the Terms and Conditions of the BrillKids Affiliate Program. Back Join now for FREE! We leave nothing to chance because if you succeed, we succeed. It's like a paint by numbers picture. If you can take action with our plan, you can make money. It's free and completely easy to get started. Within five minutes from now, you could start promoting your business to hundreds of people. New friendships and lots of fun! Our market is your market - and it's HUGE. There are over 120 million families in the United States alone who can benefit from using our products. 60% of purchasers over the internet are women, and the highest converting demographic are MOTHERS. This is a significant opportunity for parents, webmasters, bloggers and shopkeepers to make money while promoting immensely innovative and family-geared products and websites. We offer up to 30% sales commission. The more you sell, the more you are rewarded with higher commissions! Become a part of a unique online forum that is revolutionizing the way parents connect with each other. Get behind products which you believe in that will help make a difference towards educating our world's most important resource - our children. NOTE: Many of these provisions are necessary in order to safeguard the interests of our distributors, agents and partners around the world, who put in a significant amount of time, energy and financial resources into marketing and distributing BrillKids products. We therefore hope that you can understand the reasons for these provisions and support us in our efforts to strike a fine balance in looking after the interests of every party concerned. Thank you for your understanding! Affiliate Discounts DO NOT apply to Download-Only products (e.g., iAccess, Little Reader Basic - Download Only, etc.). You may not list or sell BrillKids products on your own online store without our prior written approval. If you wish to do this, write to us and we will consider the suitability of your doing so. You may NOT make price guarantees your customers such as “the cheapest price on the web” nor may you advertise discounts in relation to the prices on the BrillKids Store or the stores of any authorized BrillKids distributor, such as “10% cheaper than BrillKids Online Store” or “10% cheaper than official price”. State that using your affiliate code at the BrillKids Online Store will entitle the customer to a [X]% discount. Advertise percentage discounts which reflect existing and ongoing promotions in the BrillKids Store (eg., Mother’s Day Promotion) that are applicable to your country. For example, you may state on your website “Mother’s Day Promotion – 10% off on BrillKids products!” where we are running such a promotion at the time. In the case of selling through your online store (where authorized), display prices in your store that are discounted based on your affiliate discount code. For example, if our product is listed as $100 on the BrillKIds Online Store, and you are entitled to give the customer a 10% discount, you may list the product on your store as $90. If you host your own website, you are not allowed to use any of our trade marks (such as “BrillKids”, “Little Reader”) in any part of your domain name without our prior written approval. Please do not do anything that would mislead another into thinking that you are associated with BrillKids in any other way than an affiliate, such as advertising your website or yourself to be “Officially BrillKids”. This Service applies ONLY for registrations made through Official BrillKids websites and purchases made through Official BrillKids Online Stores. To learn more, please refer to our Terms & Conditions.